AUCTION CLOSED! Expect messages from me in the near future for all winners. Thanks for playing! It's time for everyone in the family to buy more games for each other for the holidays, but for me that means selling some in the hopes of having a little extra cash to work with. 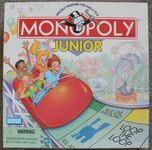 All the games in this auction come from a smoke-free but pet-heavy home (dander abounds!). Several of the games are older so I can't vouch for the smoke-freeness of them, but I helped them quit cold turkey so they've been clean for a number of years. This auction will end at 9pm PST on November 19th. I'm not going to play auction police and probably won't check in until the 20th, so any bids entered after 9 pm will be ignored, even really good ones. All games start at $2. No reserves, but I've added BIN prices that are probably all wrong and are subject to change when nice people tell me how wrong they are. Bids must be at least $1 more than the previous bid, but I don't care if they're in even amounts. If you want to bid $1.23 because it feels good to type, go for it. It will make it even more fun for the next bidder. Buyer pays shipping and games will generally be shipped via USPS Priority Mail Flat Rate (which includes $50 of insurance) from zip 98004. I'm not going to overcharge for shipping, so if you can fit a bunch of games into a single Flat Rate box you only pay a single ("flat") fee ("rate"). I will also ship Parcel Post upon buyer request for actual shipping rates, but lately Parcel Post rates have been lousy and barely less than Priority Mail. Shipping to the United States only. I'm too lazy to ship internationally. If you want to reship something to your rich Nigerian uncle, be my guest. Just make sure you have a domestic address for me to ship to. You gotta pay with paypal. 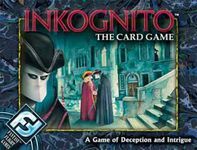 The ever-bloodthirsty BGG gets 3% of each sale. All sales will be finalized via the marketplace. Add-on items: I'm an artist who has not had much time for art this year. If anyone bidding on an item would like to add one (or more) 8x10 print of my art, I can offer them for half price at $5 each on matte paper with a board and bag. The full list of options can be found at www.spiralsinlove.com/galleries.html - please contact me directly to ask if a specific piece is in stock before making payment. Brand new. This was purchased as a gift for someone who lost their copy of Ninja Burger before I could give this to them. The cheap plastic clamshell packaging is pretty beat (shelf wear, a couple of corners are crumpled) but as far as I can tell the sealed decks and instructions are in new condition. There's basically nothing about this expansion on BGG, but Steve Jackson claims it's out of print and used to cost $17 (http://www.sjgames.com/ninjaburger/sumosizeme.html). Like new. This was sealed when I got it and I never actually played. The cards are opened and sorted but despite my best efforts I never figured out how to play what appears to be a simple and fun game. Includes English and German rule books, but they're nothing to write home about - they're basically heavy stock copy paper stapled together. Very rare game about German birds making babies. Like new. We played this once, although I don't know if it counts as "played once" if you don't get all the way to the end. It might have been an off day, but this game caused some forgotten issue between the kids that was enough to make them both decide never to play it again. I suspect it's because penguins are such an incomplete animal. The rarest Knizia game about penguins that I'm aware of. Like new components, box has a lot of shelf wear. Another one we never played but I did take out all the pieces to teach myself the game. I think there's a fun game here, but between the art and theme I've never been able to get anyone to play this with me. Includes the original unintelligible instructions as well as the ones that actually make sense that I printed off. Like new. I love Lyndon LaRouche gags as much as the next guy, but as I'm firmly anti-caricature I should have known better than to buy this game. Game has been opened and cards sorted through, but I never even played a learning game. Rare thanks to at least five people's names being spelled incorrectly on their cards. for pointing out where the correct entry lived for this game. Incredibly rare "I don't know how to search on BGG" edition. Like new - opened but never played. Apparently with all the geeky games they're forced to play my kids were too advanced for this by the time we got it. Not me though; I still have a hard time not eating the little houses. They look like my house, but candy! Like new - opened but never played. 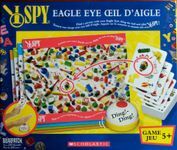 Somehow we ended up with like five different I Spy games. I hate I Spy. BONUS! 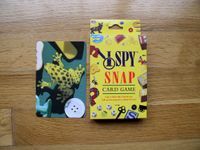 Includes a copy of I Spy: Snap Card Game. Two rare games for the price of less than one. All have been played a few times but are complete and in good condition. 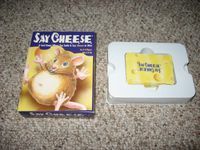 All three boxes have neat character flaps and each game uses a unique card shape. The board is actually in very good condition, but the cards are worn and the box top is split at one corner. All the cards are there and so is the "Answer Box" (a plastic case with two slots), but three of the plastic chips are missing. They're just thin plain chips though, so if you actually played you could make or find a substitute easily. Everything smells like old people. Rare, but you have to guess how rare. Good condition. One corner of the box top is split and there's a 1/2 inch square tear on the cover. Playing pieces and board are in nice shape. I wish I could say this was "an under-appreciated abstract gem" or something like that, but I haven't played this since I was a kid and I can barely remember last week so I can't comment on the gameplay. Here - some other dude did it for me. I.Q. Games: World Geography 1989 "Big Box" Edition - Full Color! I should be able to fit all of these in a medium Flat Rate box. All rare, in increasing order of rareness.